Behavioral economics and the related field, behavioral finance, study the effects of psychological, social, cognitive, and emotional factors on the economic decisions of individuals and institutions and the consequences for market prices, returns, and the resource allocation. The fields are primarily concerned with the bounds of rationality of economic agents. Behavioral models typically integrate insights from psychology, neuroscience and microeconomic theory; in so doing, these behavioral models cover a range of concepts, methods, and fields. In the last few decades, the psychological factors and the cognitive nature of human mind have become an interest of economics and finance since the role of economic actors is an essential part of conventional economic interpretation. Although it is a topic of economics for centuries in the seminal works such as ‘The Theory of Moral Sentiments’ of Adam Smith or ‘Human Action: A Treatise on Economics’ of Ludwig von Mises, modern economic and financial viewpoint is developed and established over the statistical empiricism and mathematical statistics. The mechanistic and positivist school thought that human action can be mathematically estimated and modelled. However, the intellectual accumulation on behavioral sciences as well as neuroscientific evidence have revived the debate, and the behavioral economics is born with the fundamental works of Daniel Kahneman and Amos Tversky. The prospect theory and subsequent theories of Kahneman and Tversky played a significant role and it is thought to be a milestone in behavioral research. The prospect theory ignited a stream of scholarly publications and sophisticated research on behavioral aspects of economic decisions. 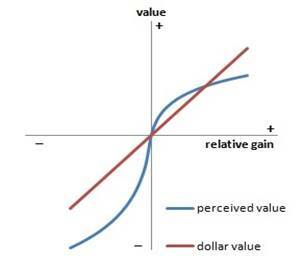 Prospect Theory and the difference between price and perceived value. The modern Austrian School of economics is closely interested in behavioural economics and its heterodox viewpoint is also one of the drivers of the field. Behavioral economics is broadly a reaction to implicit assumptions and a strong criticism of neo-classical economic approach. The major debate is arisen from the rational actor assumption (i.e. rational choice theory, rational expectations, and homo-economicus) and its spillover to several associated principles (e.g. efficient markets). Medical science has contributed to the problem from physiologic and neuroscientific perspectives. In the last decade, a stream of empirical research is performed to clarify functions of brain on decision making and economic behaviour. Neuroimaging methods (i.e. fMRI – functional magnetic resonance imaging) are used to visualize brain activity in case of particular mental conditions. One of the change-making discoveries of Neuroimaging is the role of Amygdala (an inner part of brain) on emotional reactions and memory. The term, Amygdala Hijack, is used as biological reasoning behind the irrational exuberance (i.e. mental state of market bubbles, passions boil over and dominating the behaviour). Neuroeconomics is arisen as an interdisciplinary field which uses neuroscience tools and concepts for explaining the economic phenomenon. From neuroscientific viewpoint, rationality postulate is unfeasible and biologically irrational since we are all humans with Amygdala which drives us unconsciously. Even research on patients with Amygdala damage indicated the impossibility of rationality while presenting merits of overlooking and being imposed emotionally. Without Amygdala, human brain is enforced to think purely rational and execute every piece of information to reach optimal solution by calculating the equilibrium for every single decision. Therefore, a simple shopping decision would become a burden of cognitive process without this small section of human brain. One of the thought-provoking outcomes of Amygdala discovery is the medical collapse of hypothetical rationality postulate in economics. Behavioral Economics is a new topic in the shipping business field, and there is a limited number of academic and professional experts. However, there is a growing academic interest since it becomes mainstream in economics literature. In addition to that, there are some previous studies indicated irrationalities indirectly. Many studies on market efficiency reported that the shipping markets are probably inefficient based on the rejection of fundamental evidences behind the hypothesis. One can easily find contradictory results found by different researchers and/or for different periods of markets. In 2013, I first mentioned the irrationality debate in the shipping business, and at that time I emphasized the Wisdom Hierarchy for illustrating the cognitive basis. Duru, O. (2013). Irrational exuberance, overconfidence and short-termism: Knowledge-to-action asymmetry in shipping asset management. The Asian Journal of Shipping and Logistics, 29(1), 43-58. 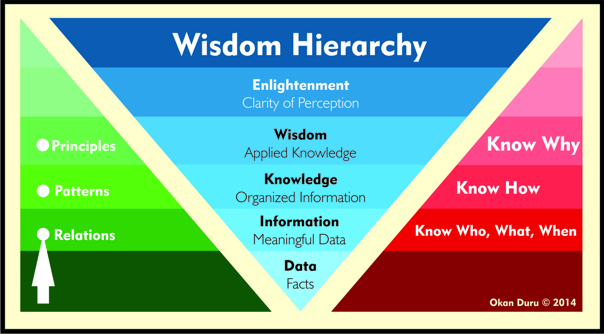 “One of the fundamental foundations of information science is the wisdom hierarchy (i.e. knowledge hierarchy or information hierarchy) which is a framework to classify the function and the degree of knowledge. Although, there are some variations among the literature, the most basic structure of the hierarchy is based on Data, Information, Knowledge and Wisdom (DIKW). Therefore, an acronym, DIKW hierarchy, is frequently used for expressing the same meaning. DIKW hierarchy briefly illustrates the process of generating knowledge and how to settle wisdom of a science or system. The difference between these levels is usually figured by the major questions. Data has no questions and it is just a value and record. Information asks “What?” (Know what) while Knowledge asks “How?” (Know how). Wisdom is a more intellectual perspective which asks “Why?” (Know why). The jargon, know-how, is frequently used to express the intelligence, experience and profession. A recent interpretation is presented by Jennifer Rowley. Rowley also indicates the reduction of programming capability and algorithm building by the increasing level of intellectual accumulation or the decreasing gap between the wisdom and current position. In other words, this statement indicates the role of sentiments and limitations of rule-based representations in higher levels of intellectuality. While data is objective facts, subjectivity has a critical role in further steps. Action-Knowledge vs. Information Knowledge- The role of subjectivity can also be derived from the fact that knowledge does not significantly contribute to the action in several cases. Israel M. Kirzner discussed the action-knowledge and the disparities between known facts and practice. Some knowledge is gained from processes, experiences etc. However, practicing knowledge is another dimension of DIKW hierarchy. In economic research, such kind of disparity is particularly indicated by behavioral economists since the rational actor is expected to practice according to the known facts. Daniel Kahneman discusses the overconfidence in economics and the reason of overconfidence is stated as “collective blindness to a risk and uncertainty”. He is also founder of prospect theory which criticizes the validity of expected utility model of rational choice theory. Although, many scholars presented the dynamics of business cycles and there is no dramatic shift from the business cycle framework, entrepreneurs still tend to invest on higher prices of peak market with very high risk of market collapse. David Colander stated the “systematic failure of economic profession” which is based on the illusion of control. The mainstream economists are usually figured by hindsight bias. COLANDER, D. (2011), “How economists got it wrong: A nuanced account”, Critical Review: A Journal of Politics and Society, Vol. 23, No. 1-2, pp. 1-27. DURU, O. and YOSHIDA, S. (2008), “Market psychology”, Lloyd’s Shipping Economist, August issue. DURU, O. (2012), “Incentives and sentiments in shipping investments: Intermediary prospects between the impatient capital and long-term competitiveness”, Journal of Logistics and Shipping Economics (JSLSE), Vol. 45, pp. 63-72. KAHNEMAN, D. and TVERSKY, A. (1979), “Prospect Theory: An Analysis of Decision under Risk”, Econometrica, Vol. 47, No. 2, pp. 263-291. KAHNEMAN, D. (2011), Thinking Fast and Slow, New York: Farrar, Strauss and Giroux. KIRZNER, I. (2005), “Information–knowledge and action–knowledge”, Econ Journal Watch, Vol. 2, No. 1, pp. 75-81. ROWLEY, J. (2007), “The wisdom hierarchy: Representations of the DIKW hierarchy”, Journal of Information Science, Vol. 33, No. 2, pp. 163-180. DURU, O. (2011). Incentives and sentiments in shipping investments: Intermediary prospects between the impatient capital and long-term competitiveness. Journal of Logistics and Shipping Economics 海運経済研究, (45), 63-72. Particularly publicly traded firms are leaded to be short-oriented in terms of company strategies and investment opportunities. Crotty also draws attention to the conversion of investors in stock markets. Rather than 1960s, the most of the shares in financial markets are now hold by the institutional investors (such as pension funds, insurance companies etc.) and these investors do not mind what the long term goals of a company. A few decades ago, households were active in stock markets and they are figured by long term investments. Today’s institutional investors manage their large amount of funds which has an extreme power on price movements and tend to investigate short-term gains. Actually the major problem exists on the valuation of the future cash flows in financial tradition. Net Present Value method is frequently used for calculating the cumulative present value of series of future cash flows. The following figure illustrates two intentions, project A and project B, on the long horizon. The long term difference between projects A and B (Laverty, 1996). LAVERTY, K.J., “Economic "Short-Termism": The Debate, the Unresolved Issues, and the Implications for Management Practice and Research”, Academy of Management Review, Vol.21, No.3, 825-860, 1996. Why DCF capital budgeting is bad for business and why business schools should stop teaching it! This is the title of an academic paper written by Ralph W. Adler (2006). Adler indicates the deteriorating and biased nature of Discounted Cash Flow method in the same way of Kevin J. Laverty. ADLER, R. W. (2006). Why DCF capital budgeting is bad for business and why business schools should stop teaching it. Accounting Education: an international journal, 15(01), 3-10.